Live your most glamorous life with these luxe velvet harem pants from Antthony. Stylized details and an easy pull-on silhouette add effortless-chic style to your everyday look. Love, love these pants. Really comfortable. Ordered more pairs for cooler weather, come next fall and winter. Not short as shown in photo (better to keep you warm), but I had to order the 1X plus sizes. Recommend. Soft, cozy and classy! Beautiful with the matching jacket. A must set to own! I wore this pant to my mother's 80th birthday party. So comfortable and feminine. I am 5 66 yo weigh 140 ordered size P1X. 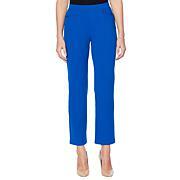 This pant is NOT what some think of as a harem pant (or MC Hammer pant! )It fits me just like the picture shows!This is the 2nd perfect fit I have ever gotten by ordering online! 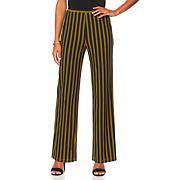 The first is Anthonys other Glamorous Life harem pant in the poly knit which seems lightweight and silky to me.Many, many years ago, I had a Carole Little St.Tropez silk pant/jacket that fit like these do. Anthony thank you! These pants are luxe. Fit perfectly soft to the touch. I normally wear a large regular, but they didn't have my size so I got petite large and they fit fine I'm 5'4. Bonus, pockets! 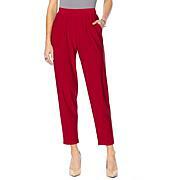 Antthony Techno Stretch Boss Lady Pant These are the pants you'd wear every day if you thought no one would notice. A flattering and comfortable scuba crepe knit, the wardrobe staple is fitted at the hip with a straight, full leg that smoothes and slims your look. 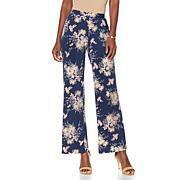 Whether your style is subtly up-to-date or just the basics, this fashionable culotte pant from Iman makes a great foundation for building a lasting wardrobe. Combining a flowy stretch fabric, easy pull-on style and classic silhouette, they easily complement your other wardrobe favorites.